We just flew through what is historically the busiest month of the year for our customer service teams here at Follow Up Boss and showing no signs of slowing. The good news is, as always we’re continuing to bolster our ranks with 4 new team members coming on board this month with Melissa, Madeline, Malia and Jarrell joining to help us in sales and support roles in an effort to provide faster, more complete service to customers both when they’re evaluating the product, and once they’ve signed on so we can help them grow. We’re also still hiring and have a few open positions so if you know anyone who would love to have a big impact at a growing company, and who thrives on the opportunity to help small businesses grow, send em our way! After several months of heavy lifting from our support team, we have fully migrated to a new, more robust support platform in a continued effort to provide faster, more actionable support for customers who need it. A big part of that was a complete reorganization and update of our knowledge base which is where you’re able to get instant answers to the most common (and many times uncommon!) questions our customers ask. This opens the door for lots of new opportunities to continue reducing response times and getting answers to you in as close to real-time as possible. Send batch emails to all email addresses! 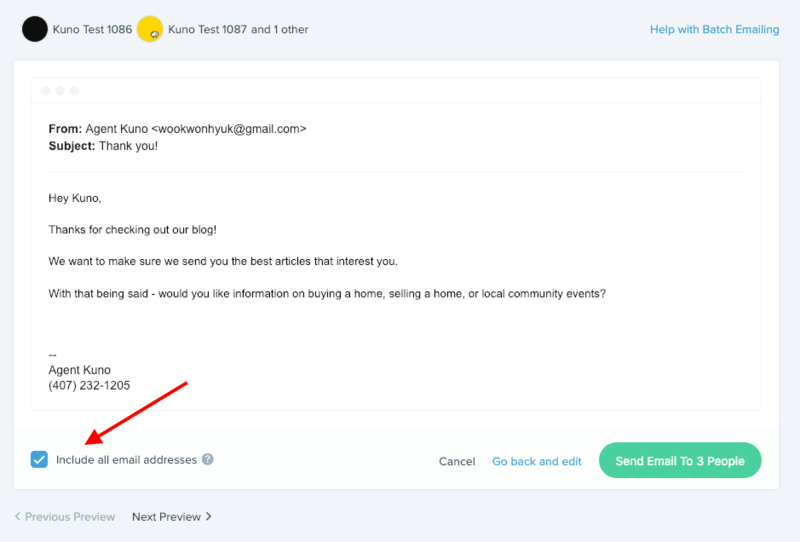 You can now send your batch emails to all email addresses on each selected person. 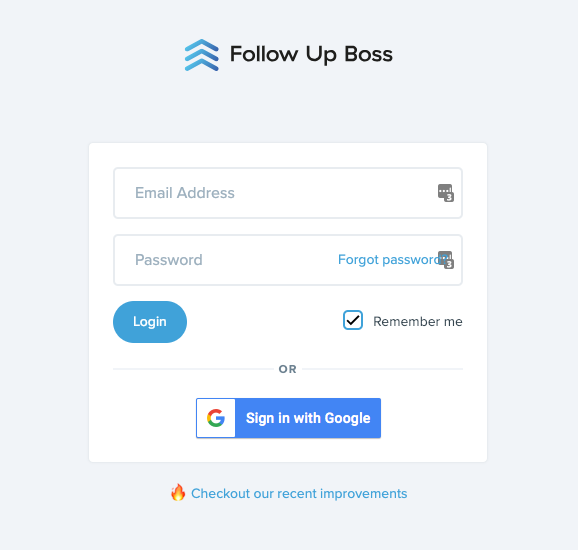 Many of our customers add the spouse’s email address and an additional email on the same contact in Follow Up Boss, so this makes it a lot easier to ensure the emails you send get to both decision makers. To make this really effective for emailing spouses, when you choose this option, we put all the emails on a contact in the ‘to’ field, so that both the contact and their spouse are part of the same email conversation, and they can hit ‘reply all’ so you and their spouse can see their response. We recently added the ability for lenders to text clients from right inside Follow Up Boss when they have the calling add-on enabled as well. This makes Follow Up Boss even more powerful when you’re collaborating closely with your lender partners and enables you to deliver a more seamless client experience. When importing a .CSV file, we now recognize the vertical bar ‘|’ character as a separator for phone numbers, email addresses and tags. This will make it much easier to import exports from Boomtown, Firepoint and other systems which include multiple email addresses in the email column, or multiple phone numbers in the phone column. Leads which Zillow has marked as “a direct call from a consumer” are now tagged with “Zillow Direct Call” in Follow Up Boss, you can use that tag on the lead flow screen in FUB. When Zillow directly assigns a lead via Zillow Tech Connect, we only honor that re-assignment if it is a new lead or the lead originally came in through Zillow. If the lead entered your Follow Up Boss account from a different lead source, we will not allow Zillow to re-assign it. To better meet google branding guidelines, as well as keeping the button familiar to everyone, we have swapped out the google button to match their design. We have split up the first and last name fields. This means Follow Up Boss no longer has to split this up automatically, which ensures you always get the correct first or last name in your merge fields. The daily Hot Sheet email had a bug, which caused it to include deleted appointments. This bug has been fixed. With this and a number of other recent improvements to the calendar, it’s now easier than ever to book appointments on behalf of your agents and keep track of their availabilities to help them stay busy and close more deals. There were cases, for example when viewing contacts from a report, where we would save this as a preference on the people table for later. These can sometimes be very large, and this isn’t something you want to be saved as a preference on the people table. We no longer will save these filters on the All People screen. The latest update (v2.6.2) fixes a bug where tapping on a notification for a message from a lead could temporarily cause it to appear in the wrong thread when the app opens. We released a fix for events created for leads coming in via Zillow Tech Connect sometimes showing an incorrect time. We now always use the time the event was added to FUB, which should be more accurate. We released a fix for notes on iPhone. There was an error that caused the iPhone app to be stuck in a loading animation (3 pulsing grey circles). To pick up the fix you will need to close app. Double tap the home button and swipe up on the Follow Up Boss app from the list of running apps.